Some things seem so far ahead of their time that they could never stick. Well, Howard the Duck has stuck. Way back in 1976, when Marvel Comics first unleashed the fluffy curmudgeon, he seemed like he’d come out of nowhere–and he had. That was his thing. He had a crunchy underground vibe to him and yet he got to hobnob with Spider-Man, the most iconic comic book character ever created. That must have been hilarious for Howard’s original creators, Steve Gerber and Val Mayerik. Back then, in 1976, Howard also got to spend time with Red Sonja, all ready for a good fight in her chainmail bikini. This time around, Howard matches wits with a whipsmart tattoo artist. She would also look fine in a chainmail bikini but it ain’t gonna happen. Tara resoundingly puts him in his place. And all he did was call her, “doll.” Pretty tepid for the Howard of yesteryear. In this new Howard comic, writer Chip Zdarksky and artist Joe Quinones are definitely working off a different vibe than what came before. While a lascivious Howard preying on half-naked women seemed so subversive in 1976, it’s a risky business in 2015. It would surely require some creative heavy lifting. And, in the cheesecake wars, this appears to be a battle not worth having. Of course, on the flipside, what have you got left once you defang a raunchy out-of-control misanthrope? In the end, the original Howard wasn’t so bad and he was more of a feminist than he got credit for. Howard was a dirty, unstable, contradictory, and thoroughly messed up duck. So, I ask you, to clean him up too much is to snuff the life out of him, no? However, if you never cared for the original underground-like Howard, then this Howard could be what you’re looking for. Consider him a second cousin to the wisecracking Rocket Raccoon. That said, this first issue is definitely a fun and worthwhile adventure. With anything possible these days, it would come as no surprise to find Howard’s activities meeting up with Rocket Raccoon’s somewhere down the line, even on the big screen. Wasn’t an appearance by Howard the Duck the teaser at the end of the credits to “Guardians of the Galaxy”? 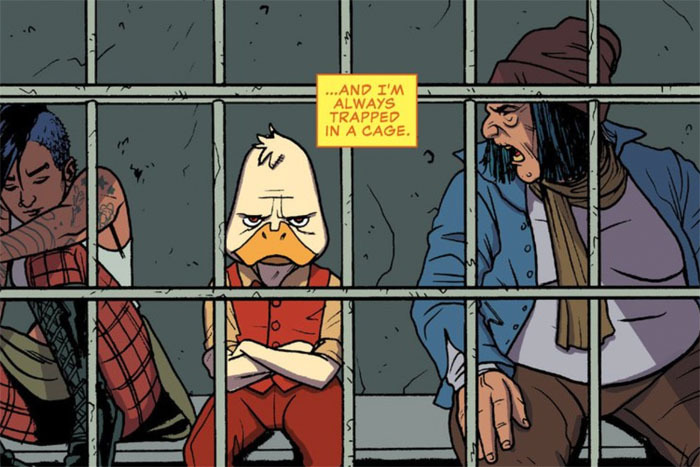 Howard the Duck #1 is available as of March 11. For more details, visit our friends at Marvel Comics right here. I have Howard The Duck on my wall, sitting on Santa’s lap with a very long list of non-negotiable demands. Great artwork. I guess I’m a little young to have gotten Howard the Duck. He was this pop culture character I kind of knew was out there somewhere, and then there was the notorious movie, and then references to the character afterwards. I suppose a new series and, presumably, movie would be a chance to get to see the character done all wrong in the lights of fans of the original. Yes, Joseph, you’re spot on. It’s another case of a character hitting his or her stride with one creator, or creators, and then at the mercy of what happens next. 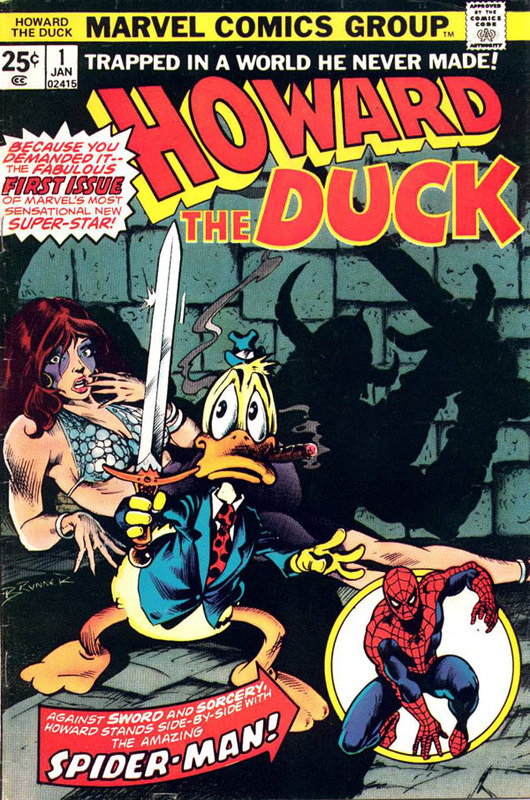 In the case of Howard the Duck, this was something that the original creators came at with a specific zest and style. It was meant to tap into the underground comix sensibility to some degree. You’ll see that shaggy dog quality in the movie from 1986. It’s a very offbeat movie that doesn’t quite add up. Today, it looks like Howard has morphed into something that will align better with current needs. My only memories (Guardians cameo aside) of Howard the Duck are that strange yet alluring film from the 1980s. Not sure if it’s a book I’ll read but nice to see an obscure Marvel character make a comeback. Check out vintage Howard the Duck and the work of Steve Gerber, in particular, and you’ll find a unique vision and sense of humor.